The winner of the $500 grand prize was Whitney Balaun of LIBRIS, who was playing on behalf of Sunriver Books & Music’s Deon Stonehouse. Last year, outdoor and regional publisher AdventureKEEN rolled out a new version of its shop local program for independent bookstores to raise money for the Book Industry Charitable Foundation. 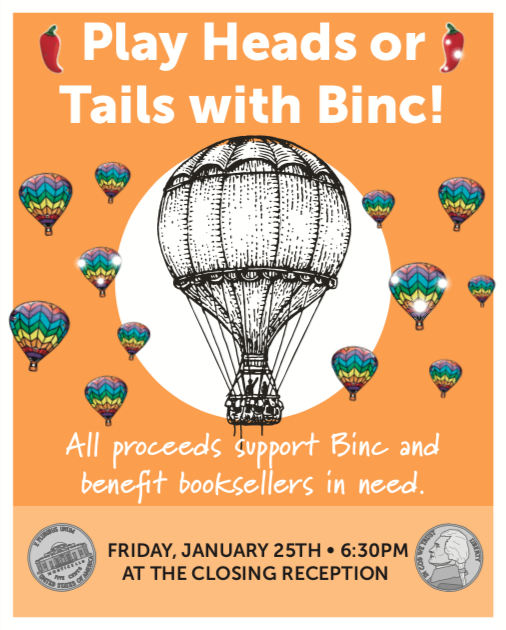 Booksellers can donate to the Book Industry Charitable Foundation by buying flashing pins onsite in the days leading up to the game, during which attendees will have the opportunity to win $500. All donations will go to work immediately to help booksellers and their families. Here, the Book Industry Charitable (Binc) Foundation and LIBRIS insurance encourage booksellers to review a disaster checklist created to help stores and staff be prepared for disasters natural or otherwise. 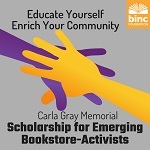 The year-long scholarship will send one bookseller to ABA’s 2019 Winter Institute and their region’s 2019 fall trade show as well as provide $1,000 to start a community outreach program through the store. September is National Preparedness Month, and the Book Industry Charitable (Binc) Foundation is sharing how it can help if disaster strikes. Binc’s Bank on Booksellers online auction of piggy banks designed by authors, artists, and celebrities will once again help raise funds for the organization. This year’s Bank on Booksellers auction to benefit the Book Industry Charitable (Binc) Foundation will help raise money for booksellers suffering from financial hardships. “All of the winners are doing their part to create a more inclusive environment and help strengthen the book industry,” said Binc Executive Director Pam French. The recipient will attend ABA’s 2019 Winter Institute and their region’s 2019 fall trade show and will be provided with a grant to establish and implement a community outreach program through their store. The program, sponsored by the Book Industry Charitable Foundation and Macmillan Publishers, offers $500 for a bookseller from a traditionally underrepresented group in the industry to attend their regional show; nine winners will be chosen. The Book Industry Charitable Foundation is seeking authors or illustrators who are interested in decorating a piggy bank for the Bank on Booksellers Piggy Bank Auction in September.